One of the many ironies of a writer’s life is that when there is nothing to write about, one has the time to write. One sits in front of the keyboard, pondering one’s navel, pulling out the belly button lint between the fat rolls and trying desperately to imagine pithy, witty words on one’s screen. In the past two weeks, I have watched a camper catch on fire, accidentally posted a swimsuit selfie “before” shot on facebook, ensured Spousal Unit got six stitches in his hand, driven to and from West Virginia, thrown a surprise birthday party for my sister, put a horse on the market, taken a horse off the market, wished a tornado would send the horse to Oz, attended two mindfulness classes, tried to find zen in the art of torching a camper, and well, y’know. Life. Of all of those stories, Daisy’s near demise from an angle grinder is probably my favorite. Anytime catastrophe looms near and is avoided is a good time. In our quest for The End of Rotten Wood, we have removed a good portion of Daisy’s rear right side, including the aluminum skin. Daisy is a Jeep Wrangler version of a camper right now. Open to the elements. After peeling off her side, Boy Child discovered that a lot of the floor where wood meets aluminum has rotted and was removing it. All that remained was a stubborn bolt that held nothing to nothing, but would not budge. Boy Child produced his favorite toy, his angle grinder. That thing scares me only slightly less than his second favorite toy, a motorized bike that he built. (Come to think of it, the mini drone he built scares the bejesus out of me also. I stay afraid. Very afraid.) He put on proper safety equipment, which included hearing protection and set to work grinding the bolt in half. Boy Child was oblivious, focused on the task of cutting that danged bolt. “She’s on fire!” I hollered, but not too loudly because, neighbors. “Burning! Fire!” It’s my writer’s vocabulary that gives me the upper hand in these situations. He noticed, threw down the angle grinder and ripped off his earmuffs. “Where’s the kitchen fire extinguisher?” he yelled. “Behind the washer and dryer!” I repeated. Isn’t it? I continued my slow motion penguin run to my car, opened the gate and the dog ran past me. Seriously? You choose NOW for a breakout? I yelled at him, but couldn’t follow. Fire extinguisher. So. Close. I looked over at Daisy where smoke roiled from her and flames shot from her side like a NOS-fueled Camaro. I stopped for a moment, mesmerized, and ever so slightly tempted. Sell the horse. Let the camper burn. Write a novel. I shook myself back to reality and grabbed the fire extinguisher. By the time I got back to Ground Zero, Boy Child had found the fire extinguisher in his own room and was aiming at the flames like Bill Murray’s Ghostbuster shooting his proton beam weapon. Who ya gonna call. The dog decided that whatever we were doing was FAR more exciting than any stupid squirrel and returned to stand beside me, panting, as if to say, “Well, THAT happened.” Fire extinguisher dust and ashes floated past us. Spousal Unit replied, “Yes. Just ordered my second martini.” I forgot that it was my Patron Saint’s holiday, April Fool’s Day. Bless his heart. He was gonna need a couple of martinis when he realized this was no joke. I laughed so hard I put out the embers with my middle-aged bladder. 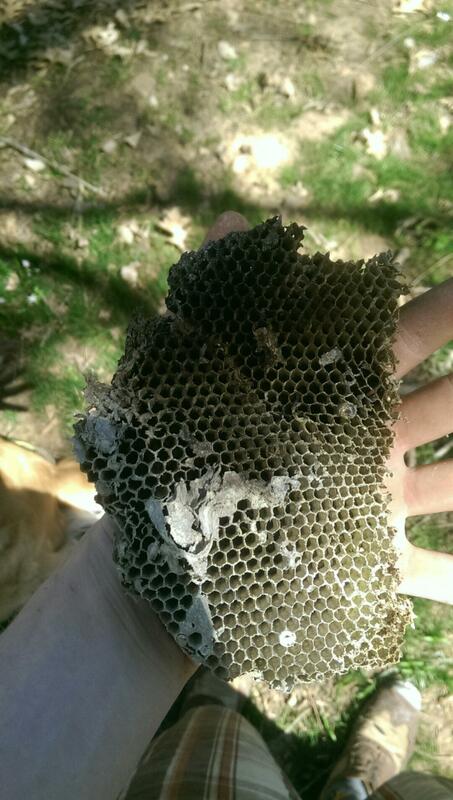 Boy Child and I performed an autopsy and discovered that the gray papery stuff layered between the metal chassis and the wood floor, was NOT asbestos, but a half-inch layer of wasp nest that was so old it should have had an historical overlay. That stuff will flat out BURN. We cleaned up the mess and assessed the situation. We could move ahead. Minimal damage was done to Daisy and I did not need a defibrillator. That is, I didn’t need one until later that day when I discovered I had inadvertently posted a “before” swimsuit pic on facebook without benefit of there being an “after.” So many stories. I am choking laughing…you are killing me! Is this the Foster or McKnight genes surfacing? This is my belly buster for this week. Have you thought about just building a building and decorating it. OMG…. the imagery you give this situation…I can’t stop laughing.